Ray Dehkharghani, an Iranian born professional poker player has won the latest gold ring at World Series of poker 2016. The event was $10K Razz Championship, to which he does well and collects the first prize of amount $273,338. Some of the top professionals of the world such as Jason Mercier, with John Racener, Brian Hastings, Bart Hanson and Rich Zhu were in the final table of the game. They were all looking to grab this opportunity to win the championship title. The event took place for three days and three nights and was concluded on the ESPN main stage at the Rio in Las Vegas. Jason Mercier was looking good at the moment and was the chip leader once in the game but somehow couldn’t able to continue the momentum and hit the rail against his opponent Dehkharghani, he finished second. Just three days after winning his fourth gold bracelet of the World Series 2016, he was back at the final table of the game at the stage. The tournament attracted 100 players and generated a cash prize pool of amount $940,000. Dehkharghani was very happy and told that ‘winning here in front of such a great players is incredible’, I’m very happy that I did it and am quite sure that I’ll do good in upcoming tournaments. 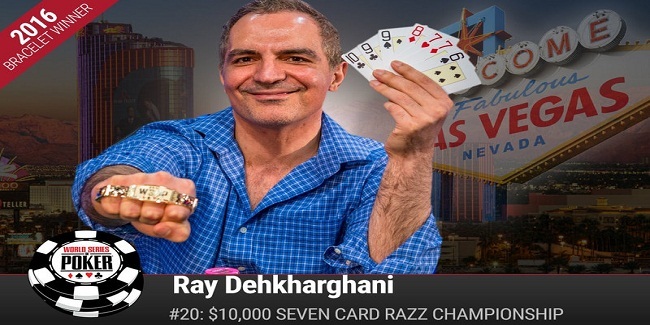 This was the first gold bracelet win for the Iranian born player in the event#20 of the series, which paid off $273,338. Total WSOP earning for the player is $681,791, which includes 6 final table appearances, 13 WSOP Cashes and 1 gold bracelet. 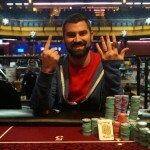 Jason Mercier of Hollywood, who had four gold bracelet in his basket concluded as the runner up for $168,936. Yueqi Zhu of china was the third prize winner with total sum of amount $116,128. Fourth, fifth and sixth places were for Brian Hastings ($82,078), with total career earning more than $1.8 Million, Robert Campbell, of Australia, collected $59,694 being fifth, whereas John Racener of Tampa bay, Florida makes $44,712 from the tournament being sixth. Another player from Hollywood Bart Hanson was at seventh position with total winning sum of amount $34,521. Meanwhile the first player who got eliminated from the final eighth was Jyri Merivirta, from Helsinki, Finland, collected $27,499 being eighth position.